Just in time for the turn of the season, Alpinestars is adding to their lightweight summer arsenal with the Ramjet Air Pants perfect for riders looking for bold styling and performance. While there is no shortage of summer riding pants, there are few as sharp and comfortable as the Alpinestars Ramjet Air Pants. They have their sights set on dry warm weather riding conditions and the forward facing mesh panels and vents ensure plenty of direct ventilation will keep you cool. CE approved knee and tibia armor will keep you safe without weighing you down and the pre- curved articulation of the legs with our favorite accordion stretch panels are a welcome addition. Notably, the fit of these pants has been adjusted from previous Alpinestars products and they can be worn as standalone pants instead of overpants which will be a relief for so many riders. 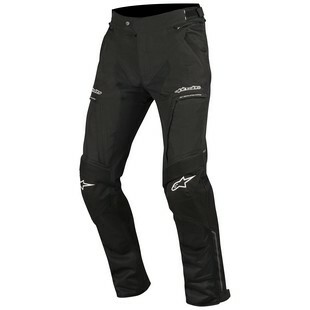 With a sleek racy design, the Alpinestars Ramjet Air Pants are sure to draw attention and impress with performance.